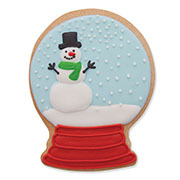 Embrace the magic of the holiday season with the 4" Snowglobe Cookie Cutter. There are innumerable ways to decorate these cookies- dress them up for Christmas, Hanukkah, or just winter in general. Impress your friends by bringing these to a party instead of fruitcake or brownies! 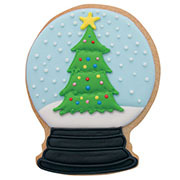 Perfect cut snow globe cookie! Cleaned up and was shined like new! Absolutely love it! It is adorable! I know when I order from Ann Clark I am guaranteed a quality product with years of future use. I have given up on other cutters holding up to the use. These retain their shape, their edge, and wash up beautifully. I love my Ann Clark cutters, and hope to have the entire collection of every cutter they have made. Just love them all! The quality of this cutter is great! It makes great cookie shapes. I used the candy decorations (Santa, Gingerbread men, Snowman, Christmas Tree) to make a scene inside the "globe" and used the white candy pearls to add snow. Too cute! 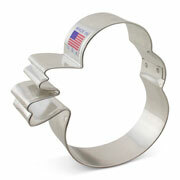 Really cute cookie cutters. I was looking for some different cutters and found the snow globe & the car with Christmas tree.